Pension Wise is a free and impartial government service about the different ways you can take money from your pension. Appointments are over the phone or face to face. At the end you get a summary of the pension options and possible next steps. To book an appointment you should be 50 years old or over and have a defined contribution pension. Pension Wise guidance specialists are impartial – they don’t recommend any products or companies and won’t tell you how to invest your money. For more information visit the Pension Wise website or phone 0800 138 8292 (or +44 20 3733 3495 if you’re outside the UK) to book an appointment. 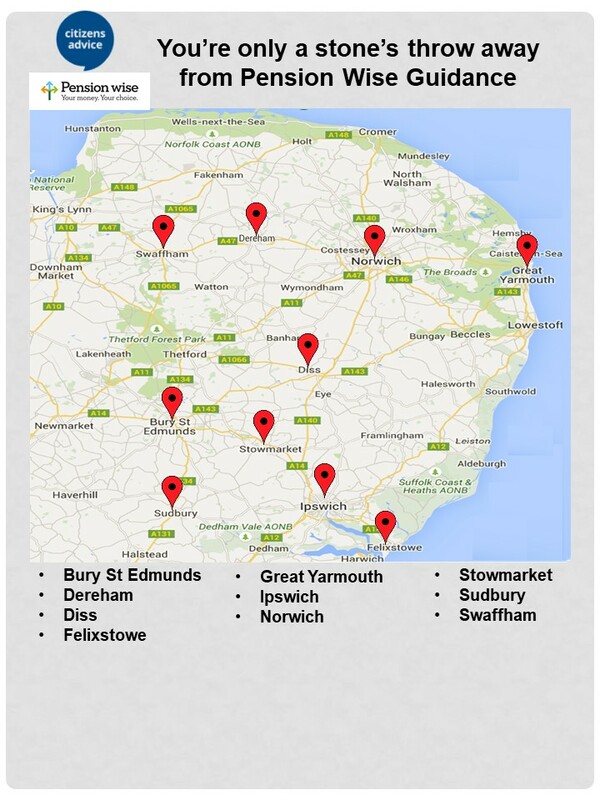 Bury St Edmunds, Dereham, Diss, Felixstowe, Great Yarmouth, Ipswich, Norwich, Stowmarket, Sudbury, Swaffham.